Hey Handsomites! Eric and Robbie come out swinging this week, powering through an unepic week of Weekly Floppies featuring not a single Buy! 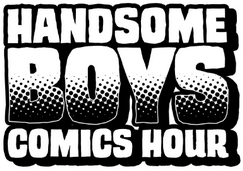 They talk video games and computer systems (surprising, I know), and talk about art, the definition of comics, and the fundamentals of comics storytelling in Nerd Boy Book Club! Minor technical difficulties aside, another great week, another great episode! Check it out! This entry was posted in Episodes and tagged amazing spider-man, avengers, forever evil aftermath: batman vs. bane, rai, reverend peyton's big damn band, risk of rain, scott mccloud, star wars: knights of the old republic, understand comics, vertigo quarterly: cyan on May 5, 2014 by handsomeboyscomicshour.